Oh, how I love prosciutto. I think I would eat its salty deliciousness with, in or on pretty much anything, but my favorite thing to pair it with is pork tenderloin. Something about the pork-pork combo really gets me. In the words of Emeril, pork fat just totally rules. 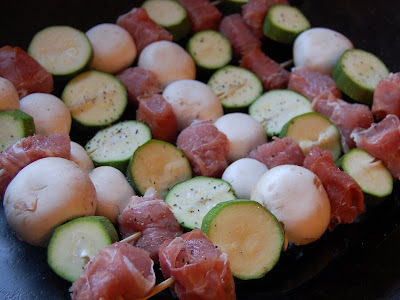 When I saw these kabobs combining prosciutto-wrapped pork pieces with zucchini and mushrooms, I was immediately smitten. Even though Joe over-cooked them just slightly (he got distracted with talking to our neighbor over the fence), they turned out to be just as delicious as I'd hoped. Because I never buy flavored oils (seriously, why spend the money when you can make your own so easily? ), I used regular olive oil that I added a few cloves of crushed garlic to and cooked over low heat until the oil just started to bubble. The flavor infused perfectly. Nothing screams "summer" like a grilled kabob, so this meal was a nice way to say goodbye to summer as we welcome the cooler weather. 1. In a small bowl combine oil, lemon juice, and crushed red pepper; set aside. 2. Trim fat from pork. Cut pork into 1 1/2-inch cubes. Cut prosciutto into 1 1/2-inch-wide strips. Wrap a strip of prosciutto around each pork cube. 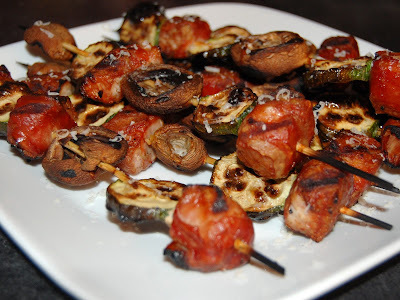 On (metal or water-soaked wood) skewers, alternately thread pork cubes, mushrooms, and zucchini, leaving a 1/4-inch space between the pieces. 4. Just before serving, sprinkle kabobs with parmesan cheese.